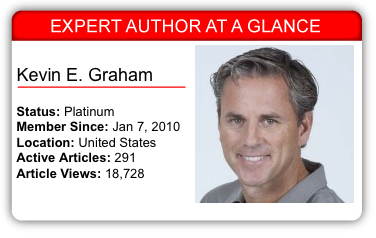 Today’s Expert Author Case Study introduces us to Expert Author Kevin Graham, who builds article sets based on issues he’s passionate about. Kevin didn’t consider himself a great writer when he started working on his first article writing and marketing campaign, but that didn’t stop him from giving it a try. Now, with nearly 300 articles to his credit on EzineArticles, he sees the benefits of writing and sharing his knowledge with the world. Plus, he has discovered that developing good writing habits is a never-ending process. As part of our ongoing Expert Author Case Study project, we asked Kevin to share his thoughts on article writing and marketing. According to Kevin, his unique set of life experiences dictates the themes and messages he develops for articles. He only writes about things he is truly passionate about, and this passion helps him figure out what others find valuable. We are each unique in our experiences and skills, yet we all have a growing passion for writing and for the awesome power of article marketing. Would it surprise you to learn that I had to take English 1 FOUR times in college? I do not see myself as the best writer, but as I write about my passion — helping people lose weight — it just seems so easy. It is enjoyable and people seem to respond. I don’t see it as being an “Expert Author,” but rather that I have a unique set of experiences and for each of us that comes out in our writing. In a word: Regularity, and I do not mean hours per day. More in the sense of a barge going down a river. It may not look like it’s going very fast, but it doesn’t stop moving so it gets there fairly quickly. Whatever your time allows, if you maintain progress you will accumulate a quantity of offerings. As you write about your passion, you’ll get lots of quality along the way, too. I focus on the cumulative effect of the content. If I were to measure value one article at a time, it would not be so clear. It is the aggregate of content that I feel makes for a strong online presence. I am a consummate student of my industry, so I am always uncovering new stuff that other people offer and many times I write about their stuff in a positive light. It’s a wonderful experience to have someone contact you and do a favor in return after they discovered something you’ve written about them. I also pay attention to the problems and questions that my market comments on across the Internet. Press on both gas pedals. It’s like the old adage about quality time with your kids. “Quality time with your kids comes from spending a quantity of time with them.” That’s how you get to those special moments that lifetimes are made of. EzineArticles is affecting my traffic and, just as importantly, it’s helping to drive my presence in a crowded and noisy industry – weight loss. It provides traffic from other sources as the articles are republished. It’s amazing how advertising and marketing has changed in the last 5-10 years. People no longer want to be interrupted with commercials, cold calling or intrusion marketing. Consumers want to discover quality offerings along their journey. Article marketing, just like efforts to place other quality content, do just that. The beautiful thing is that it is organic and it has staying power. When you pay for traffic through Pay-Per-Click Marketing [PPC], it is transient in nature and, frankly, it doesn’t convert as well. But again, the bigger value comes from the fact that these articles are out there driving traffic year after year and it only took me 30 minutes to write and publish it. That is a huge Return On Investment (ROI) that simply cannot be found elsewhere. Creating “remarkable” content is my quest – whether that be through articles, blog posts or videos. It is a key component of my marketing plan. Your commitment to quality, original content and the confidence it provides creates a great partnership and you enable an incredible amount of education in the world. Not to mention, EzineArticles protects the source and does not publish derivative content. EzineArticles separates itself from the others by providing a platform of integrity, original quality content and tools that make the process easier. The ones that I rely on regularly include the following: Article Manager, Email Alerts, Title Suggestions, Keyword Tools and Author Rankings. I know that there are other great tools that I have yet to discover. Not a lot. I was attracted by the #HAHD Challenge (100 Articles in 100 Days) and quickly realized that while it may seem like a lot, I could do double. We are in a whole new world and content is critical. I’ve made a personal commitment to publish 50 articles per month and while that may seem like a lot, this is a marathon for me. It is not easy to start a new business no matter what all those that sell snake oil claim. I am in it for the long haul and the more you write the easier it becomes. I would suggest that they embrace their market and reach out to other leaders and entrepreneurs to highlight other people’s offerings as much as they highlight their own. It may sound crazy, but there is value in the sandbox. I would also challenge any new writer to think about their quantity and quality limitations and blow them up – they are capable of 5-10 times what they initially consider to be a legitimate goal. Discover your passion and share it with the world. It will come back to you in the months and years ahead. The Tortoise Beats the Hare – Maintaining regular progress in your writing keeps things moving. Write every day to build quality content. The aggregate of individual articles eventually makes a difference. The Internet Landscape – People want to discover great information on their own. Article writing and marketing gives us a chance to provide great content for free and generate a reputation for that content at the same time. Stay Committed to Quality – Building a reputation for quality content is a key to being successful in article writing. If someone finds the answers they are looking for in your content, they’ll be much more likely to seek your content in the future. Have a Plan – Before you jump right into writing articles, have a plan. Writing an article at least every day is an ideal way to get started, and if you have a plan, it’ll be easier to meet deadlines and stay organized. Try the 100 Articles in 100 Days Marathon Challenge (HAHD) to stimulate your writing senses and get writing every day. Don’t be Afraid to Be An Apprentice – Look to other experts for what else is going on in your niche. At first, they can give you some direction for where to turn for new content. Then, eventually, you’ll be able to figure out your own ways to get article ideas. Why not take some of Kevin’s advice and put it to good use today? And, as always, leave a comment for Kevin. He’d would love to hear from you! Great information Kevin. I’ve just recently stepped my article writing and love the idea of the 100 articles in 100 days. Congratulations on your progress and thanks for sharing. Thank you Donovan. A good balance between quality and quantity (I think) is the right approach to article marketing. Too much focus on one or other stifles the aggregate effect. Super article, Kevin. I applaud you for your intensity and productiveness. It takes a lot of commitment and determination to produce quality content at that rate! Thank you Mimi. I love the personal story on your site. A huge THANK YOU to EzineArticles for selecting me as this week’s Feature Author. As a relatively newbie myself, it is an honor and privilege and I am most grateful. I’d like to add a comment on the value of article marketing. As I pounded out the articles for The HAHD Challenge (Hundred Articles in Hundred Days), along with the extra one hundred I pounded out for my own personal stretch-goal of 200 articles, I realized that Voila, I had the makings of my first book. A few dozen edits later and it was published in a matter of a few short months. The book is entitled Weight Loss Empowerment, “50 Ways to Lose Your Luggage” and at this moment I am feeling guilty for not giving EzineArticles credit (at least in part) for the inspiration and the framework that article marketing provided to get my book on the market. The book has nine Five Star Reviews on Amazon, I’ve been on a few radio spots and my Empower Me Photo business (we help those seeking weight loss by revising their photo to show them looking slim and healthy so they stay motivated on their diet or exercise program) is highlighted in this month’s SHAPE Magazine as a result of my aggregate marketing efforts – which again, fundamentally included article marketing. Anyone who knows anything about Article Marketing knows that EzineArticles is the best in the business- and my only Article Marketing partner. EzineArticles rocks! Feel free to shoot me a note if I can assist any of your efforts. Thanks Kevin. I am a newbie at article writing and keep getting emails from marketers about how to write for EzineArticles because of the benefits it can bring to any internet business. I was particularly impressed with your perserverance given your challenges with mastering English- you are a wonderful example of what can be done if we keep to our goals. Thank you Pamela. If I had a nickle for every time I heard a pro athlete state that they were always the last one picked as a youth, well I probably wouldn’t have enough nickles to retire but I’d have a lot of them. Success comes from experience and experience comes from failure – it’s a matter of keeping after it. The market place is self sharpening. Remarkable content works! Thanks for the encouraging words Kevin. I am not new to writing but I am new to article writing. It doesn’t seem so daunting now. Thank you Frances. With your writing experience, you ought to be able to pound out some serious quantity. Get after it and you’ll be top ranked in your niche before you know it. All the best to you! Great advice and congrats on your success. I notice you have almost 20,00 article views in only approximately 10 months of article writing, do you have any advice as far as increasing the views each article gets (ie. do you do anything to the article after it is published), or do you simply let the search engines help you out and find it? Thank you Dr. Ciurysek. You raise a legitimate question on leveraging the content being placed. Ezine has some great content and recommendations on their site so I defer to them as the experts. For me, there is not a lot that I do once an article is placed. The links in the Resource Box help. The keyword suggestion tool (or rather title suggestions) was used frequently. Writing about topics relevant to your marketplace is important and intriguing titles are a plus. I hope that helps. PS. No offense, but I’m glad to see that you are not one of those doctors that prescribes meds at every turn. I swear the way the big drug companies have their grip on society I think I would trust the guy who sells my neighbor weed more than I would trust most MD’s these days. Again, no offense. And thank you for the comment and great question! Thank you Joan. Isn’t amazing that we can step out of our range of perceived limitations if we just shift our mindset a bit. It’s like any great coach, they are successful because they push the athletes beyond their (perceived) limitations. HAHD is a great concept but most folks could blow that out of the water if they simply produced regular content. I’m not saying it is easy but I rarely see successful people making choices based on what is easy. Best wishes to you! Your story has truly inspired me, a novice who has just begun and only got my first ever article accepted. I will keep in mind all the tips you have shared and I am truly grateful to you for sharing your insights. you are truly a gift to the world. Thank you Mario. You are too kind. Best wishes on your quest. A journey of a thousand miles begins with one step – or something like that. Keep your vision in mind so that as FUD (Fear, Uncertainty and Doubt rears its ugly head) you can maintain course. Let the vision empower you! Thanks for an informative article. But you left something out? How do you monetize your efforts? Affiliate marketing? None of us do this for the fun of it so where is the payoff? Thank you John. I’m a pragmatic at heart so I absolutely love your question. To me, and I do not pretend to have any monopoly on truth or wisdom in any area, it is about the aggregate mix of activities. Yes, Empower Me Photo does work with Affiliates – we’ve only recently launched that and no real dollars from it yet but the program (similar to Article Marketing) takes time and should build upon itself. In today’s online and offline world, there are endless choices of where we place our bets with our time and budgets. I’m not sure that any decision is life or death but rather the adjustments we make along the way that help to steer the ship are important. I’ve not hit any finish line yet so take my words as just one person’s view. The same would be true of video placements – most of my initial ones were horrible but the analogy I use was a gem I heard from Arnold Schwarzenegger from before he became a world class body builder; he had a fat gut so he cut off the midsection of all of his shirts so that he was forced to show his poor belly. This caused him to focus on developing his area of deficit. That was the same approach I took with Article Marketing. We can extend this conversation if you like because like I said, I’m a pragmatic and with questions come answers. Best to you and thanks again! Wow, my baby brother is doing well! I’m proud of you Kevin. Keep up the good work. Bob, my big brother. So great to see a fun comment from you. We all know that your content is much more ‘remark-able’ than mine so you should be embracing an HAHD sometime yourself. Much love to you and the family! Can you believe that our wives still put up with us after all these years? When I get a thought I write it down. When I have enough thoughts for one specific topic then I sit down and try to put it all together. I’m moving forward day by day. I’ll get there soon. Thank you Peggy. Great to hear of your approach and best of luck on your journey! Congratulations Kevin for being such an inspiration to all struggling article marketers. You have shown something insightful about generating traffic through your own initiative…and through EzineArticles. Keep sharing your wisdom to us all. Thank you Larry. I appreciate your kind words. I’m still learning how to create remark-able content and wish you the best in your efforts. It’s great to see an honest hardworking guy in the health and wellness industry who’s in it for the long haul and not just trying to make a quick buck. Keep up the good work! Thank you Rod. The long haul yes but the baby still needs a new pair of shoes – especially now that they are in high school and growing out of them seemingly every week. I like your Orthotics site! I have just read your case study and was impressed by reading your ideas. I have just started writing on here although I have written on other sites for a couple of years. I am interested in getting myself writing the article a day strategy. Thank you John. The barge analogy is a bit old and not many people on the west coast even know what a barge is but if you do, you know they move slow and keep moving. The tortoise and the hare. Best of luck with your efforts. I usually delete a lot e mails or have a quick look through them. I decided to read your e mail and I found it to be very inspiring. I always put article writing down to “It’ll take me forever to write x amount of words. I have two articles on EzineArticles, one I put on a couple of days ago, but when I saw the article about making one long article into eight, I decided going to give it a go. I already have decided what I’m going to write about. Thank you Donald. Great to hear that their idea of 8 from 1 caught on with you and that it will trigger you to drive more content. Quantity and Quality. Best of luck! Thank you Kevin, your advice is simple and down to earth. Sharing your experience to success gives a boost to newbie writers like me. And thank you EzineArticles for sending us such letters of encouragement to help us on. God bless everyone. Thank you Chitralekha! So nice to see your kind words and many blessings to you. Create a vision of your future and let the vision empower you! Dedication is the key. Kevin you have dedicated your efforts to creating and optimizing this content and been consistent at it. That’s why you have got the kind of article views (not to mention other places your articles might have been published) you got in such a short span of time – from Jan 2010 to October 2010. Thanks for being such an inspiration. I can hardly stop myself from typing – so let me head over to the article submission page…! Thank you Clayton. I love your dedication to your destination – the article submission page. Digitizing paper is a noble cause in my mind (off topic I know) and I like your site. Thank you – good inspiration! The only thing that I don’t quite understand is the mechanisim by which publishers pick up and distribute EzineArticles. Do you know how this is structured? Thank you Tomatzso. The process of publishers picking up articles is a bit nascent to me but I would suggest that when you see ones circulating you try to identify the similarities to uncover commonalities and stick with what works – if that helps. Best to you! Thank you Kevin for your great advice. I’m now on my 15th articles for the #HAHD challenge (100 articles in 100 days). Yes, I agree with you that writing quality articles needs to be a part of your passion. Thank you Crisologo. I like your site, too. Best of luck in your writing – with your niche, I would think you have an endless list of potential articles. All the best to you! Your article and your story is such a huge encouragement for me! I’m terrified starting each new article, and I, literally die at just thinking which topic (in nutrition) would be more interesting to people. Then, after rewriting it many times and posting it on my blog, I find out in a week or two there are sentences I do no like – and I rewrite them again. How to move on to the next one and leave the old one as it is? (English is my second language). Thank you, Kevin, for sharing your great tips. Thank you Marta! I’ve traveled to most parts of the world and still really only speak one language – other than the usual doko desu ka toilet? that is; I cannot even phathom how so many others master multiple languages so I applaud your article writing aspirations in your second language. No one’s writing is ever perfect and Lord knows mine is far from it. If you write about compelling topics that are timely and relevant it is my view that the audience will look past any amateur penmanship to get the points of your message. Quality nutritional information is critical to people solving their obesity challenges so keep up the good work. Great article…you’ve summed up so many good points very effectively. Thank you, it’s quite a motivating article! Thank you Happy Family Travels! I hope that it motivates and empowers you! All the best to you! And that’s what I’ve needed. I’m going to write an article for EzineArticles! Thanks so much! Thank you Lynda! I LOVE YOUR SITE! Very neat stuff and I am sure that people will love your articles. You are sharing direct experiences and that will allow you to show your true self – writing is actually a journey in self exploration as much as it is self expression. All the best to you. Kevin, continued success to you. Everyday I try and write something new, I look for people like you to inspire me to give back. Thank you, this is so great! Thank you Lisa for your kind words. You’ve got some great articles and I think an enhanced Bio would help your audience connect with you in a deeper way. Okay I just updated my profile and hopefully that provides a richer insight about me. Let me know your thoughts. Thanks. Do you rely soley on article marketing or do you utilize other methods, i.e., do follow blogs? I find article marketing to be one of the best methods, but I’d be interested to understand your perspective. Thanks. Thank you Lisa for your question. I try to mix things up quite a bit. I have an Empowerment Blog on the Empower Me Photo site. My recent book Weight Loss Empowerment, “50 Ways to Lose Your Luggage” (which has been a function of my Article Marketing activities) has helped me to land speaking engagements. I run a local seminar series and collaborate with other authors as best that I can – plus all of the offline stuff. My view is that the answer lies in the aggregate of tactics. EzineArticles is the best – IMHO. Thank you Kevin for your inspiration and practical advice – which I shall follow. “Discover your passion and share it with the world” has prompted me to get back in touch with my purpose! Thank you Carole! I’m thrilled to see anyone get prompted. Best wishes in keeping the ball moving forward. thank you kevin for the peans of wisdom that you have brought out in your case study. i hope i can be an author who is half as good as you are. Thank you Harish. Your words are kind and I wish you the best in your pursuits. Hi Kevin, I really like your remarks especially about building quality content over the long term as well as finding experts and leaders of our respective markets to help us develop further. Thanks very much and all the best with your future plans.